Its been a truly exciting season so far at West ham with a series of contrarian results, where the Hammers have beaten the big boys while often stuttering against the lower clubs. 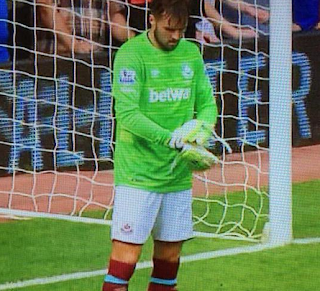 Perhaps no single player has captured this inconsistency as much as Carl Jenkinson. Having returned from parent club Arsenal for a second on-loan season, Jenks has produced some stunningly good (e.g. Crystal Palace) alongside some astoundingly dreadful (err Bournemouth) performances. The Jekyll and Hyde nature of his season was well in evidence against Palace where he scored a super goal marauding from right back and then gave away a foolish penalty only 90 seconds later! Moreover, Jenks had a veritable nightmare against Bournemouth that ended in a red card but in most matches has been solid at the back while offering plenty pushing forward. And against Leicester he demonstrated his versatility by even doing a stint in goals after Adrian was dismissed. All of this makes for fun and games for Hammers fans, but Jenks will be hoping to iron out the craziness if he is to realise his international aspirations. Today's clash with Chelsea can provide an excellent opportunity to show his ability to manage top class opposition, especially if the Special One opts to use the offensive talent of Eddie Izzard. Jenks will look to stifle any fun and games from the back in form winger while creating a few problems for Chelsea down their left flank. Either way, Jenks has become a fans favourite and with all the high jinks he has truly embraced the true West Ham way!